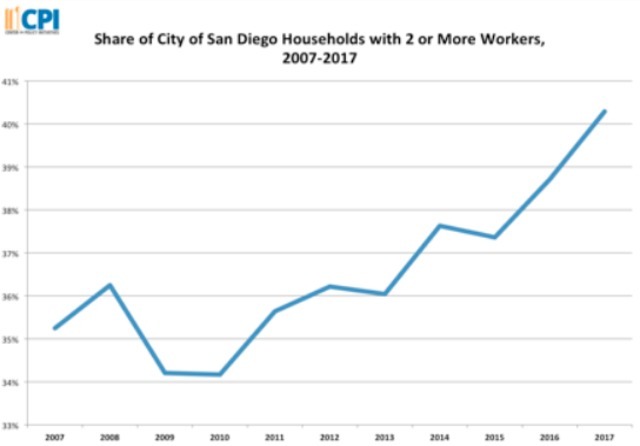 SAN DIEGO (KGTV) -- More San Diegans are working, but that money isn’t going as far as it used to due to inflation, according to a report from the U.S. Census Bureau. In 2017, the median household income jumped five percent from 2016, mostly because more people per household worked. When adjusted for inflation, however, earnings dropped for a third year in a row. The two charts below show the relationship between the number of people working per-household and the amount of money they earned. San Diego’s poverty rate remains well above the U.S. average at more than 13 percent. "The good news is households have higher incomes, but only because more family members are working," said CPI Research Director Peter Brownell, PhD. "Wages are still lower than before the recession in real dollars. When you factor in inflation, people are still losing ground." The report found that more and more people over 65 are still working in San Diego as opposed to starting their retirement. One in five seniors worked in 2017, the bureau says. In San Diego County, El Cajon has the highest poverty rate at an alarming 21 percent.